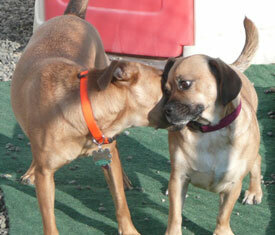 We provide a fun, safe and healthy experience for your dog while you are away. See our A Day at Camp page for a description of a typical day at K9 Country Club. must come for an evaluation and sociability test. K9 Country Club features two spacious rooms for overnight campers. Both rooms are heated for comfort in the winter and air-conditioned in the summer. 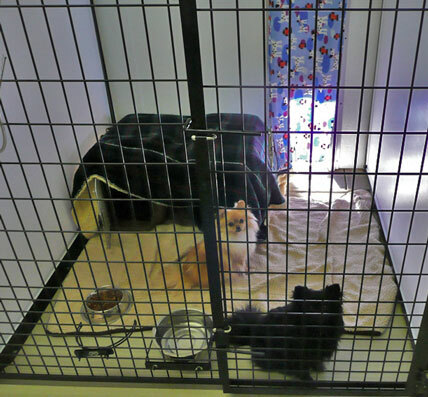 The Little Dog Room houses seven suites and is designed for small- to medium-size dogs. 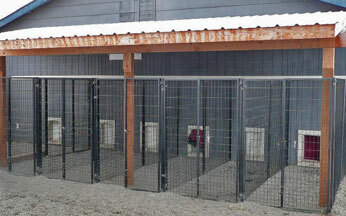 Each private suite measures 5' x 5' inside with a 5' x 5' outdoor enclosure accessible by a private doggie door. The Big Dog Room has nine suites measuring 4' x 8' inside and 4' x 10' outside. 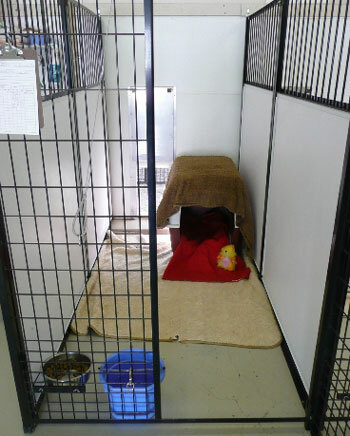 A private doggie door leads to an individual outdoor enclosure where campers can go out for a potty break or lounge in the fresh air during nap time. All outdoor portions of the suites feature pea gravel or pavers on the ground and are covered overhead so the area stays clean, dry and shaded. During extreme temperatures, each doggie door is fitted with a fabric cover to maintain a comfortable temperature indoors. Inside, each suite is set up with a soft floor covering, a cozy bed or crate (depending on the dog's preference) and an extra fuzzy blanket for snuggling. Each suite also has its own water and food bowls. We provide everything your dog needs to enjoy a comfortable stay away from home. See our What to Pack page for a detailed list of items to bring for overnight visits. With comfortable spaces and easy access to the outdoors, the Little Dog Room is also ideal for geriatric dogs. Please let us know if your dog requires special accommodations. All of our suites are roomy enough for family members to share.